Enhance the speed, ability, and productivity of your PHI Automatic Steel Beam Welding Lines by adding auxiliary equipment. Used during the manufacturing of “H” beams, the flanges are automatically tilted to a vertical position against magnetic rollers prior to assembly with the web at the tacking fixture. Done in the past manually by one or two operators, this can now be done automatically, reducing manpower requirements. This tilting system is intended for use in welding lines without automatic tilting systems provided originally by PHI. This Flange Tilting System is a self contained system that can easily be installed by the customer as an add-on option. 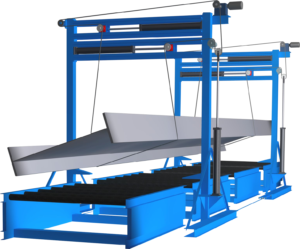 This option will enable you to increase production by rotating the beam and welding on both sides of the beam which is required by some building codes. 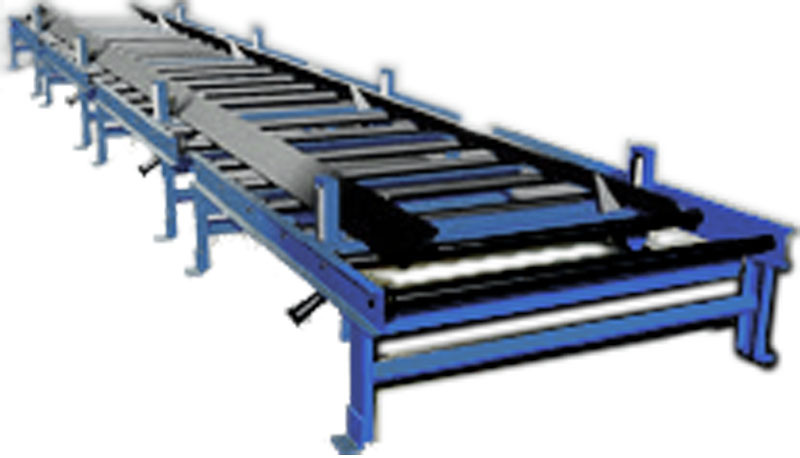 The turning system consists of frame that straddles the conveyors with lifting cylinders, and a chain driven gear motor. Two frames are provided, one is fixed, the other movable by motor on rails along the length of the conveyors. Maximum travel from the fixed frame will be sufficient to accommodate 15m long beams. The system will be operated from a hydraulic power unit with 15 GPM and 20 HP, with manifolds and valves. Maximum beam size for turning is: 12.5mm thick web, 1830mm wide. 15m long and 16,000 lbs.